10 A None No Power Seat 10 A is a Business Class Bulkhead seat with restricted legroom due to the position of the Bulkhead wall. The close proximity to the galleys and lavatory may be bothersome. There is no floor-storage for this seat during take-off and landing. There is a bassinet location here, so passengers traveling with infants are often seated in this row. 10 C None No Power Seat 10 C is a Business Class Bulkhead seat with some extra legroom as the Bulkhead does not fully extend to the aisle, but may be bothersome. The close proximity to the galleys and lavatory may be bothersome. There is no floor-storage for this seat during take-off and landing. There is a bassinet location here, so passengers traveling with infants are often seated in this row. 10 H None No Power Seat 10 H is a Business Class Bulkhead seat with some extra legroom as the Bulkhead does not fully extend to the aisle, but may be bothersome. The close proximity to the galleys and lavatory may be bothersome. There is no floor-storage for this seat during take-off and landing. There is a bassinet location here, so passengers traveling with infants are often seated in this row. 10 K None No Power Seat 10 K is a Business Class Bulkhead seat with restricted legroom due to the position of the Bulkhead wall. The close proximity to the galleys and lavatory may be bothersome. There is no floor-storage for this seat during take-off and landing. There is a bassinet location here, so passengers traveling with infants are often seated in this row. 11 C None No Power Seat 11 C is a standard Business Class seat. 11 H None No Power Seat 11 H is a standard Business Class seat. 12 C None No Power Seat 12 C is a standard Business Class seat. 12 H None No Power Seat 12 H is a standard Business Class seat. 13 A None No Power Seat 13 A is a standard Business Class seat. 13 C None No Power Seat 13 C is a standard Business Class seat. 13 H None No Power Seat 13 H is a standard Business Class seat. 13 K None No Power Seat 13 K is a standard Business Class seat. 21 A None No Power Seat 21 A is an Economy Class Bulkhead seat with restricted legroom due to the position of the Bulkhead wall. The tray table is in the armrest, making the armrest immovable and slightly reducing seat width. There is no floor-storage for this seat during take-off and landing. There is a bassinet location here, so passengers traveling with infants are often seated in this row. 21 B None No Power Seat 21 B is an Economy Class Bulkhead seat with restricted legroom due to the position of the Bulkhead wall. The tray table is in the armrest, making the armrest immovable and slightly reducing seat width. There is no floor-storage for this seat during take-off and landing. There is a bassinet location here, so passengers traveling with infants are often seated in this row. 21 C None No Power Seat 21 C is an Economy Class Bulkhead seat with some extra legroom as the Bulkhead does not fully extend to the aisle, which may be bothersome. The tray table is in the armrest, making the armrest immovable and slightly reducing seat width. There is no floor-storage for this seat during take-off and landing. There is a bassinet location here, so passengers traveling with infants are often seated in this row. 21 H None No Power Seat 21 H is an Economy Class Bulkhead seat with some extra legroom as the Bulkhead does not fully extend to the aisle, which may be bothersome. The tray table is in the armrest, making the armrest immovable and slightly reducing seat width. There is no floor-storage for this seat during take-off and landing. There is a bassinet location here, so passengers traveling with infants are often seated in this row. 21 J None No Power Seat 21 J is an Economy Class Bulkhead seat with restricted legroom due to the position of the Bulkhead wall. The tray table is in the armrest, making the armrest immovable and slightly reducing seat width. There is no floor-storage for this seat during take-off and landing. There is a bassinet location here, so passengers traveling with infants are often seated in this row. 21 K None No Power Seat 21 K is an Economy Class Bulkhead seat with restricted legroom due to the position of the Bulkhead wall. The tray table is in the armrest, making the armrest immovable and slightly reducing seat width. There is no floor-storage for this seat during take-off and landing. There is a bassinet location here, so passengers traveling with infants are often seated in this row. 24 A None No Power Seat 24 A is an Economy Class seat that is missing a window. 25 K None No Power Seat 25 K is an Economy Class seat that is missing a window. 27 A None No Power Seat 27 A is an Economy Class seat that may not recline due to the Exit Row behind. 27 B None No Power Seat 27 B is an Economy Class seat that may not recline due to the Exit Row behind. 27 C None No Power Seat 27 C is an Economy Class seat that may not recline due to the Exit Row behind. 27 H None No Power Seat 27 H is an Economy Class seat that may not recline due to the Exit Row behind. 27 J None No Power Seat 27 J is an Economy Class seat that may not recline due to the Exit Row behind. 27 K None No Power Seat 27 K is an Economy Class seat that may not recline due to the Exit Row behind. 44 A None No Power Seat 44 A is an Economy Class Exit Row seat with extra legroom. However, this seat may not recline due to the Exit Row behind. The tray table is in the armrest, making the armrest immovable and slightly reducing seat width. There is no floor-storage for this seat during take-off and landing. 44 B None No Power Seat 44 B is an Economy Class Exit Row seat with extra legroom. However, this seat may not recline due to the Exit Row behind. The tray table is in the armrest, making the armrest immovable and slightly reducing seat width. There is no floor-storage for this seat during take-off and landing. 44 C None No Power Seat 44 C is an Economy Class Exit Row seat with extra legroom. However, this seat may not recline due to the Exit Row behind. The tray table is in the armrest, making the armrest immovable and slightly reducing seat width. There is no floor-storage for this seat during take-off and landing. 44 H None No Power Seat 44 H is an Economy Class Exit Row seat with extra legroom. However, this seat may not recline due to the Exit Row behind. The tray table is in the armrest, making the armrest immovable and slightly reducing seat width. There is no floor-storage for this seat during take-off and landing. 44 J None No Power Seat 44 J is an Economy Class Exit Row seat with extra legroom. However, this seat may not recline due to the Exit Row behind. The tray table is in the armrest, making the armrest immovable and slightly reducing seat width. There is no floor-storage for this seat during take-off and landing. 44 K None No Power Seat 44 K is an Economy Class Exit Row seat with extra legroom. However, this seat may not recline due to the Exit Row behind. The tray table is in the armrest, making the armrest immovable and slightly reducing seat width. There is no floor-storage for this seat during take-off and landing. 45 A None No Power Seat 45 A is an Economy Class Exit Row seat with extra legroom. The tray table is in the armrest, making the armrest immovable and slightly reducing seat width. There is no floor-storage for this seat during take-off and landing. 45 B None No Power Seat 45 B is an Economy Class Exit Row seat with extra legroom. The tray table is in the armrest, making the armrest immovable and slightly reducing seat width. There is no floor-storage for this seat during take-off and landing. 45 C None No Power Seat 45 C is an Economy Class Exit Row seat with extra legroom. The tray table is in the armrest, making the armrest immovable and slightly reducing seat width. There is no floor-storage for this seat during take-off and landing. 45 H None No Power Seat 45 H is an Economy Class Exit Row seat with extra legroom. The tray table is in the armrest, making the armrest immovable and slightly reducing seat width. There is no floor-storage for this seat during take-off and landing. 45 J None No Power Seat 45 J is an Economy Class Exit Row seat with extra legroom. The tray table is in the armrest, making the armrest immovable and slightly reducing seat width. There is no floor-storage for this seat during take-off and landing. 45 K None No Power Seat 45 K is an Economy Class Exit Row seat with extra legroom. The tray table is in the armrest, making the armrest immovable and slightly reducing seat width. There is no floor-storage for this seat during take-off and landing. 59 A None No Power Seat 59 A is an Economy Class seat in the last row of the plane that may not recline. The close proximity to the galleys and the lavatories may be bothersome. 59 B None No Power Seat 59 B is an Economy Class seat in the last row of the plane that may not recline. The close proximity to the galleys and the lavatories may be bothersome. 59 C None No Power Seat 59 C is an Economy Class seat in the last row of the plane that may not recline. The close proximity to the galleys and the lavatories may be bothersome. 59 H None No Power Seat 59 H is an Economy Class seat in the last row of the plane that may not recline. The close proximity to the galleys and the lavatories may be bothersome. 59 J None No Power Seat 59 J is an Economy Class seat in the last row of the plane that may not recline. The close proximity to the galleys and the lavatories may be bothersome. 59 K None No Power Seat 59 K is an Economy Class seat in the last row of the plane that may not recline. The close proximity to the galleys and the lavatories may be bothersome. A variety of audio channels are available. 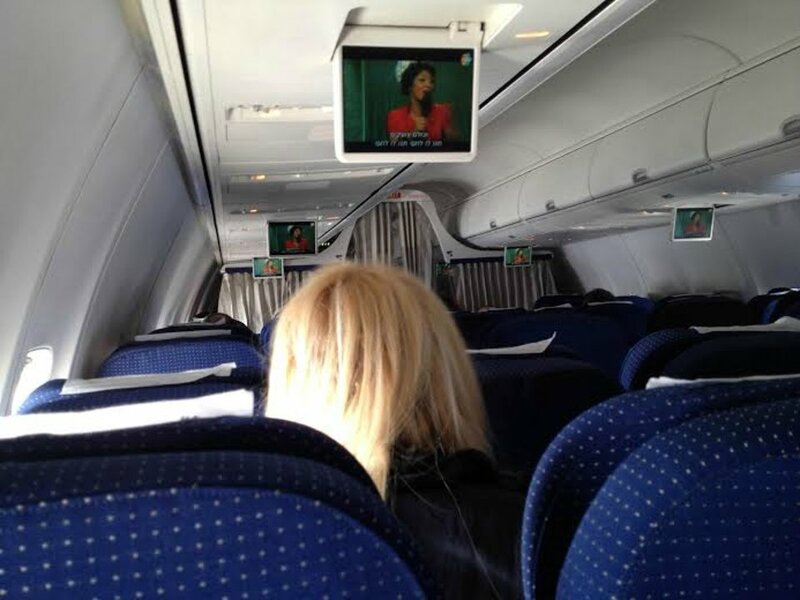 Overhead TVs are located throughout the cabin. El Al offers a Wi-Fi on this aircraft. El Al offers a selection of meal choices, soft drinks, beers, and Israeli wines. El Al flies the Boeing 737-800 with 154 seats in a two-class configuration of Business and Economy. One lavatory has been removed and rows 27 and 59 have been added to the original 126 Economy Class seats. Seat are regular but do not recline at all. Tray table were in front seats as normal. The window side armrest is shortened. Window is slightly Forward from the seating position. 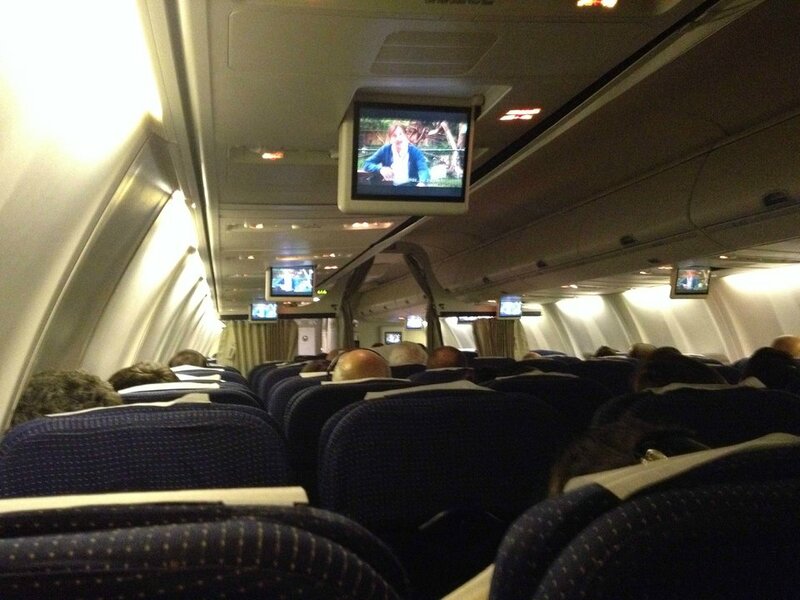 Though the aircraft wasn't the most modern one in the skies, El Al certainly gives you the best in-flight service. And very tasty food! In the last years I have flown the Brussels Tel - Aviv route +- 100 times planes on this route crappy as the meals but great crew. The row behind 58 was for exclusive use by flight attendances who had quick naps during the flight there. This allowed you to recline your seat freely without anyone complaining or bumping against your seat. Noise from the galley was on an ok level as well, so this was really an ok seat for an afternoon flight. The worst flight I ever had, never again with EL-AL. When I booked on March 15,2016 for my flight to Paris on April 19 I at the same time I was ALSO assigned a seat 49 H for my return flight on May 3. BUT, at the EL-AL check-in at CDG I got 27H instead - WITHOUT any explanation. At that time I did not know that it's the worst seat on the plane. Doesn't recline & leg room was almost non existent because the leg space for the row 27 was reduced and added to the row behind after the exit door, they had wonderful space!! It was so awful to seat rigid for 5 hours squeezed like a sardine in a box. The cold air from the a/c is not even and I got a cold air flow which couldn't be adjusted. I am 80 years and it's not funny. I left Paris healthy and right now I got to TA' sick. My back is killing me and I have a very bad cold and cough. And it's not the end of the horror story as I will be going to Paris on June 6th again and as I look at my ticket Flight 323, Return Flight 324 on June19 I have been assigned SEAT No 27 ! 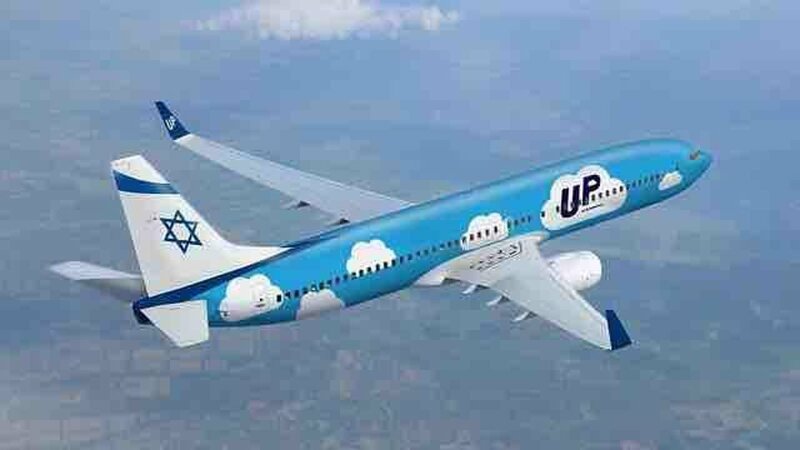 I demand to upgrade my next flight starting June 6 and of course Return flight on June 19, I am not letting EL-AL ruin my health and my trip. Besides the food is sooo awful, I did not touch it. You should be ashamed of yourself. That's the way toi treat your passengers and especially old people. Believe me, instead of enjoyting the thought of my next trip in June I am terrified. 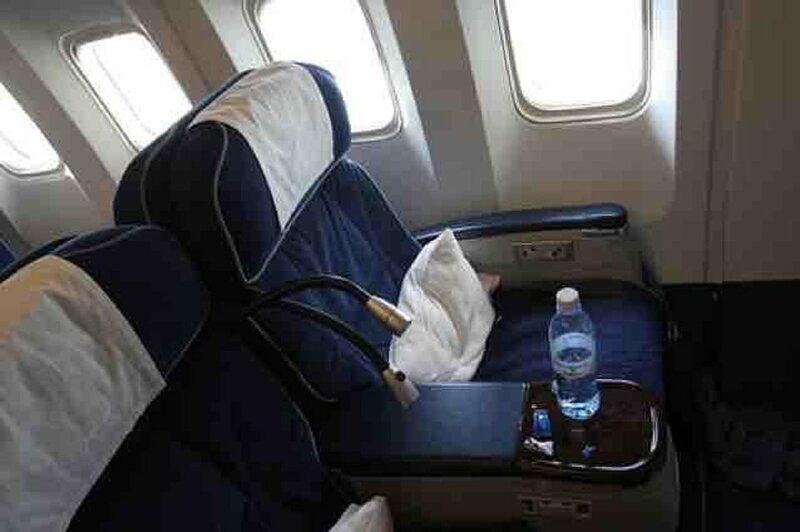 The seats in El Al 737-800 which flies most of the routes to Europe are so crowded that anyone 175 cm and taller will not be able to sit without jamming your knees into the back of the seat in front of you. This has been my experience on several flights with El Al to Europe. Avoid flying with El Al. 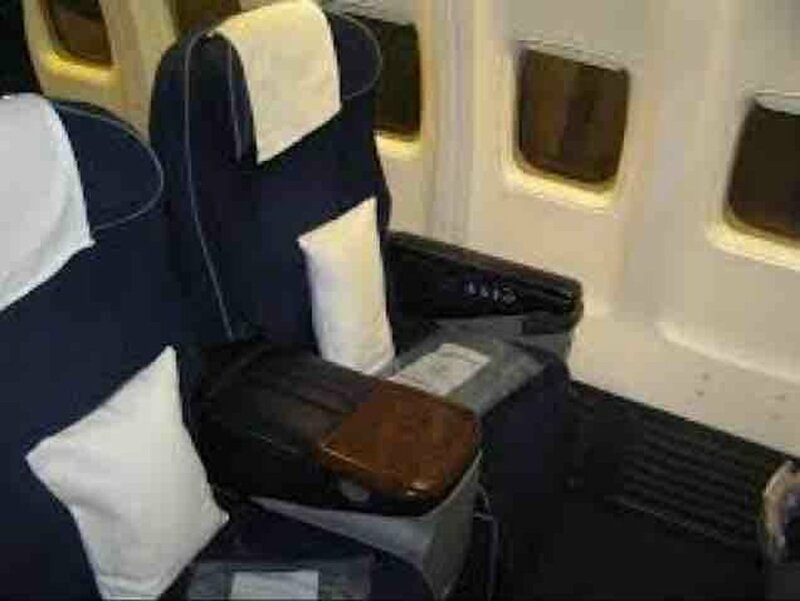 Though refered to as "Business Class" these seats are more like Domestic First on North American carriers. They provide much more comfort compared to economy seats and the service is much better, but they can't compare to flat bed equivalents. That said, if you are flying El Al between Israel and Europe, it is better than what most European carriers call "business" which is an economy row with the middle seat left vacant. Seat 44A does have plenty of leg room, the fact that it has no recline can be bothersome in direct relation to how long the flight is. My personal issue was the seat is not as wide as others due to the fact that the exit is basically a small door that is thicker than the rest of the fuselage and takes some of your space. Actually felt a bit claustrophobic. If you have a very slim build and don't mind the non existant recline, by all means, enjoy the legroom. Standard economy seat with extra leg room due to being an exit row seat. Seat does not recline which could be an issue on longer flights. The seat is bowever of normal width as the tray is in the back of the seat ahead and not in tne arm rest, all in all a good seat for us taller passengers and it doesnt cost any extra for this seat either. the seat does have extra leg room but not worth it that the seat has no recline at all. very uncomfortable especially since half armrest only because of the overwing exit door. avoid at all costs as no point having extra leg room if you cant lean back and enjoy a good nap. lucky for me the seat next to me was empty so I curled up against the wall with 5 pillows and streteched over 2 seats. Row 44 is very comfortable, it has extra legroom and I didn't mind so much that the seat couldn't recline. This seat did not required extra charge so grab it if you can. EL AL flies 2 versions of Boeing 737-800.